On my recent trip, I reported finding the rarely collected Megacyllene comanchei at several localities in northwestern Nebraska and southwestern South Dakota. These are significant findings, since they not only represent new records for both states, but also an impressive 700-mile northern extension to the known range of the species (on top of a previously reported northern range extension from Texas into Kansas). The intriguing part of the situation is that these new records fall within the southern portion of the known distribution of M. angulifera, its closest relative, which has been recorded from several northern Great Plains states and provinces (although it has not yet been recorded specifically from Nebraska). 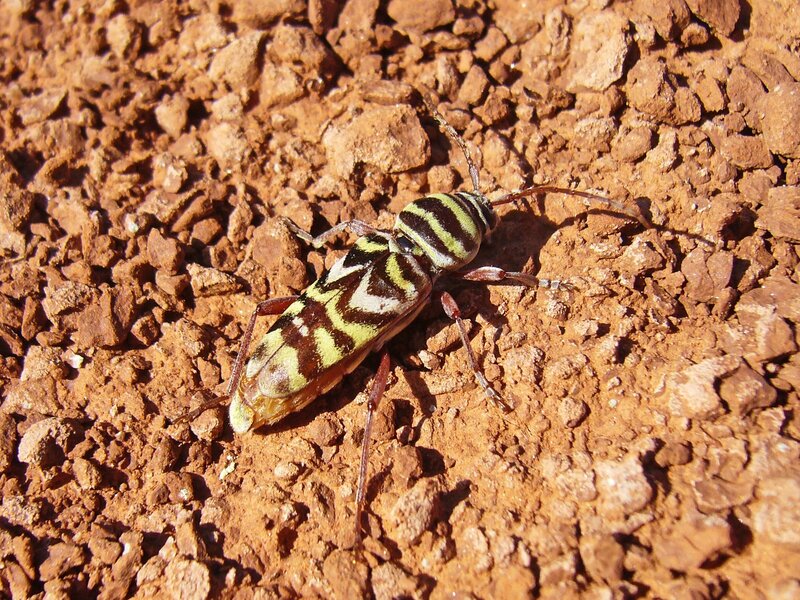 Upon reading about these findings, a friend and fellow student of Cerambycidae has expressed doubts to me about the distinctiveness of M. comanchei versus M. angulifera, regarding the slight color differences upon which it was based as insufficiently distinctive. In its original description (Rice & Morris, 1992, J. Kans. Entomol. Soc. 65:200-202), M. comanchei was distinguished from M. angulifera by a specific combination of characters, i.e., the premedian and sutural segment of the postmedian elytral bands are white, while the remaining pubescent bands are yellow. They also noted the subapical and apical bands often coalesce along the elytral suture and lateral margins. I do not have material of M. angulifera for direct comparison, but my specimens (two of which are pictured in this post) seem distinct enough from this specimen of M. angulifera pictured on Larry Bezark’s impressive website, A Photographic Catalogue of the CERAMBYCIDAE of the New World. In contrast, the pattern of coloration seen in this photo of the holotype of M. comanchei (also from that fine site) seems to agree well with my material. Whether these color differences are significant remains to be seen. Neither species has been commonly collected, therefore large series of material have not been available for good comparative studies. However, there do seem to be significant differences in reported host plants and adult biology. Adults of M. angulifera are usually found in the fall on flowers of Solidago (goldenrod), and it was recently discovered that the larvae utilize root crowns of Dalea candida (family Fabaceae) for development (Blodgett et al. 2005). All but one of the remaining Nearctic species of Megacyllene for whom larval hosts are known also utilize fabaceous plants. These include M. robiniae and M. snowi (Robinia), M. decora (Amorpha), and M. antennata (Prosopis). A notable exception is M. caryae, which breeds in a variety of deciduous plant genera but most often Carya and is also unique in that adults occur during early spring instead of fall. Megacyllene comanchei, on the other hand, was discovered by examining the dead root crowns of Heterotheca sp. (family Asteraceae), with a few crawling on the ground in areas where such plants were growing. This is not proof that it serves as a larval host, but the repeated association of adults at the base of dead stems of this plant is highly suggestive. Additionally, no adults were encountered on goldenrod or other flowers, as is common among other members of this genus. The apparent utilization of a non-fabaceous larval host and behavioral difference exhibited by the adults seem to support its status as separate species. Again, the specimens that I collected agree not only morphologically with M. comanchei, but also behaviorally in that all of them (six specimens at three localities) were found crawling on the ground in shortgrass prairie rather than on flowers. I did note Heterotheca growing at one of the locations but did not find adults on the crowns of the few plants I inspected. I do not recall seeing any Dalea, but I wasn’t looking specifically for that plant either. Nor did I not see any goldenrod, which I would have certainly noticed had it been present. So, for now, I’m inclined to continue calling these M. comanchei, and I’m also inclined to consider it distinct from M. angulifera. I do agree, however, that a critical examination of the distinctiveness of these two species might be warranted, and it may be worthwhile to pull together as much of the existing material of these two species as possible. I am interested in hearing other opinions about this situation. This entry was posted in Cerambycidae, Coleoptera and tagged beetles, entomology, insects, longhorned beetles, nature, Nebraska, new state record, science, South Dakota, taxonomy. Bookmark the permalink. Were you also finding angulifera in or near the locations where you were turning up ccomanchei? The elytral banding pattern looks very different from angulifera, though I don’t have enough experience with either species to know how much variability they typically exhibit. Still, white rather than yellow banding strikes me as a pretty strong distinction. Hi Doug. No, I didn’t collect any that look like angulifera – if I did that would have immediately raised suspicions. With angulifera from the northern Great Plains and comanchei from Texas, I could easily see a situation where a clinal gradient goes from all yellow in the north to yellow/white in the south – in such a situation, populations at the north and south extremes could look like distinct species if no populations in the intervening areas had been encountered. In this case, however, I’m finding specimens that look and act like comanchei within the recorded range of angulifera. The apparent host/behavioral differences, which clearly suggest divergence, are what are swaying me right now. I did not notice Dalea in the area, but then I wasn’t looking for it either (I was unaware that Dalea was the recorded host for angulifera until after I got back home and started looking into this). It may be another good example of why such information is so critical rather than relying on morphological characters alone for species separation. There are so many invertebrate species whose biology we know absolutely nothing about! Seems to me and my small mind that you may want to focus on host plant utilization. Interesting stuff. cedrorum – Your mind isn’t so small, it’s the host utilization thing that’s keeping me from agreeing with my friend. Show me comanchei on goldenrod or breeding in Dalea and I’ll bite. I think there are many ‘cryptic’ species awaiting discovery, if only we will look at things other than white vs. yellow. Interesting stuff! Why do the beetles crawl on the ground? I believe the females are looking for oviposition sites at the base of the host plants, since the larvae tunnel through the upper root crown. Males perhaps might crawl on the ground looking for females. I have caught this species also in flight and on flowers. It could be that Megacyllene comanchei is actually common and widespread but have just been lumped under M. angulifera because of the similarity of appearance. The color differences alone likely are not enough to justify distinct species status, but the apparent biological differences are much more significant. I once made a 20-hour round trip to look for one species (fortunately I was successful). I was sort of baffled looking for possibilities, since none of the host plants listed for other species in the genus grew anywhere near that area (it was all very dry shortgrass prairie), but there might well have been Heterotheca and there were certainly other composites. Sounds like an interesting project for someone! Great subject and post, Ted. I’m on a Megacyllene quest. What a beautiful species. Any Texas localities for comachei? ‘Bycids are hard to resist. 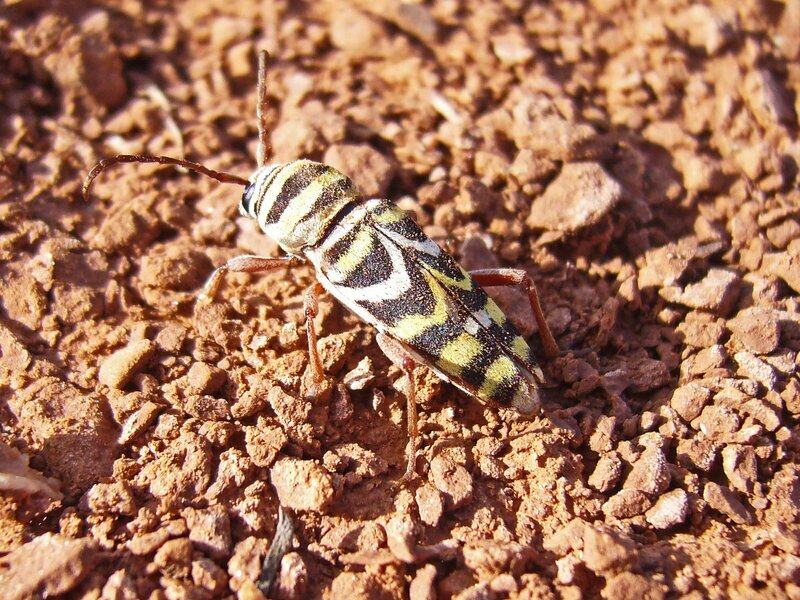 The type locality of Megacyllene comanchei is in the Rolling Hills region of west Texas (Rice, M. E. and R. F. Morris. 1992. 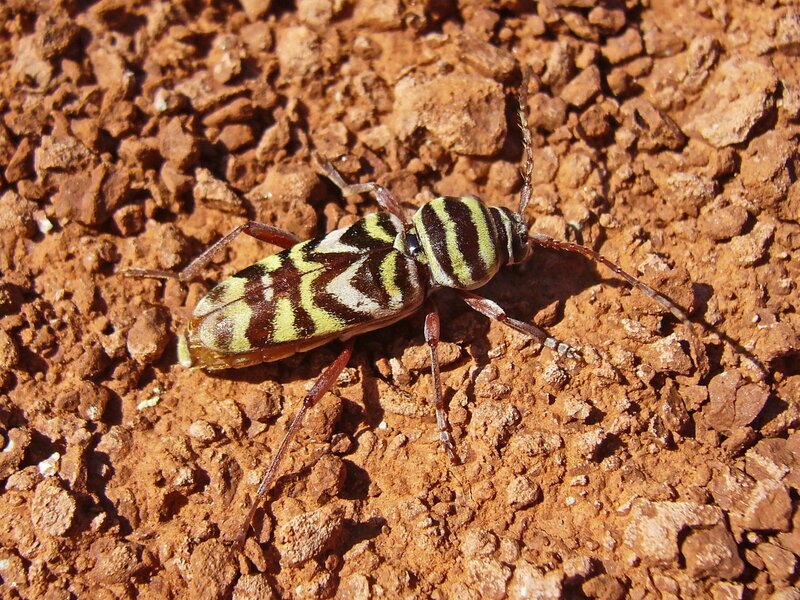 Megacyllene comanchei, a new species of longhorned beetle (Cerambycidae: Coleoptera) from Texas. Journal of the Kansas Entomological Society 65:200–202.). However, considering I’ve recorded it also from Kansas and South Dakota it seems to be rather widely distributed across the Great Plains. Thanks, Ted, for the info and citation.